Nepal… Mum & Dad… the cycling is over! In May - the merry month - once again we begin to see abundance in the world around us. May blossom heralds harvest and the fruit to come. The poet from Worcestershire noticed how often May coincides with the great Forty Days of Easter - another time of abundance - a time of delight equally full of signs of hope and promise - a time for us truly to enjoy. Christians try never to allow the songs of Easter to evaporate and vanish in a single day or week. The whole season offers us the opportunity not only to celebrate the resurrection Gospel but also to gather its fruit and - yes - to store it carefully for further use. During this time of the year, we follow Jesus’ own advice - ‘lift up your eyes, and see how the fields are already white for harvest. He who reaps receives wages and gathers fruit for eternal life’ (John 4:35,36). Think of the Easter fruit to be gathered. At the centre of the new life for which we give thanks - Jesus’ and our own - is growth, development and transformation, the gradual replacement of seeds with fruit. It can be miraculous how over years, or perhaps quite suddenly, our lives and our personalities develop and change; how communities are changed; how a congregation discovers new strategies and confidence; how openness and trust replace fear and anger; how forgiveness nourishes and refreshes both our inner lives and our public face; how God’s new world replaces the old and brings us strength and purpose. What are the sources from which to gather such Easter fruit? Three suggestions for the time being, each of them perhaps rather surprising and all of them certainly demanding. Fruitfulness is found in silence, service and suffering. As we saw in Holy Week, those were the same three places where Jesus found the presence of God and his power to heal and save. On the cross he endured the vast and terrifying abyss of silence; he endured horrific and numbing pain for the sake of others (‘for their sakes I consecrate myself’, John 17:19); and because the cup of suffering was not taken away, he drank to the dregs. Yet in these three places Jesus did not move further away from God but came closest to him. This was the actual, concrete reality from which God raised him up. No: he could not save himself from these things but God turned them into the life-giving sources of renewal and healing. The Easter Gospel is neither empty piety, sentiment, nor wishful thinking. It affirms that to find God we must be with Jesus in both cross and resurrection. Nor need we be ashamed of our frailty or our tendency, like the disciples, to run away. Precisely in our weakness, our sorrows, our disappointments, our confusions, our despair, our grief and our pain we are with Jesus actually gathering fruit, finding courage and even now receiving God’s gift of abundant life. Due to the changes presented by Fr Michael’s sabbatical, it will no longer be possible to have a Eucharist every week at 8pm on Tuesdays at All Saints’. There will continue to be a Eucharist at 8pm on the last Tuesday of each month (30 May, 27 June, 25 July and 29 August) and we are hoping to have a non-eucharistic service led by members of our Local Ministry Team on the other weeks of the month - see future weekly sheets for details. This may take various forms, such as Compline, Stations of the Resurrection or the Rosary. The Eucharist will continue to be offered daily in one of our churches across the Team and, since God’s Spirit often works through the necessities of life, we hope this change may represent a real opportunity to refresh our prayer lives with other forms of worship. Faith is a life-long journey that can take many paths but an important part of this is receiving communion, for Jesus promised, ‘Whoever eats my flesh and drinks my blood has eternal life’ (John 6:54). At baptism we become full members of Christ’s body, the Church, and communion does not add to that but it does offer strength and help in living life as a Christian, as we are changed day by day to be more like Jesus. Classes for children who would like to think about preparing for First Communion begin on 17 May and continue every Wednesday (except half-term) until 12 July at St. Nicolas’ Church, 5-6pm. They are open to children from Year 3 or above who worship at any of our three churches. If children have not already been baptised that can form part of the preparation too. Meanwhile young people at secondary school may prefer to prepare for First Communion through Elevate, which meets 5-7pm on Sundays in term-time at St Nicolas’ Hall. Beginning the classes does not mean that anyone must make their First Communion and it is perfectly okay for someone to decide at any stage that they are not ready. For more information or for a sign-up letter, please contact Fr Grant. Adults who are thinking about making a commitment of faith and confirmation or who would just like to explore some of the questions that being a Christian in today’s world presents are very welcome to join Celebrate! Plus which meets at 8pm on most Thursdays. For more details, please contact Sue Read. At the recently held annual meeting Mr Jerry Porter and Mrs Marion Beagley were elected as Churchwardens. Mrs Sue Bolton and Mrs Margaret Compton were elected as wardens with responsibility to St Nicolas’. Mr Henry Morris and Mr Cyril Beer were appointed as deputy wardens for St Mary’s church. Mr Colin Holman and Mrs Janet White were elected to the PCC and Mr Peter Horne was elected as representative to the Deanery Synod. The annual report of the PCC and the financial position of the churches were presented. The 2006 Prestbury and Pittville Youth AGM followed the Parish AGM held on Sunday 2 April. This marked the end of the second full year of the charity’s operation. There were more members present this year and they received reports on the youth work undertaken and the financial health of the charity. The report on youth work, produced by Andy Macauly, Youth Development Worker, detailed an increasing number of young people involved in a wide range of activities. Six regular weekly groups had been run, as well as holiday weeks, all-nighters, camping weeks, weekends away and monthly support meetings. Chairman, the Revd Michael Cozens, and Treasurer, Mrs Gill Wood, presented the 2005 Annual Report and Accounts which, despite there being a small loss on the year, showed a balance carried forward in three different reserves. The level of funds raised from Grant-making Trusts had dropped and more would need to be raised from committed giving by local supporters. Thanks to the nomination of Liz Underwood at the meeting, the Executive Committee has a full complement for 2006. The Revd Michael Cozens continues as the Chairman and Gill Wood is Treasurer. Tricia Wilson has returned as Hon Secretary. Charlie Chan and Julia Hook were appointed by All Saints’ PCC, Linda Biggs and Daphne Philpot by Prestbury PCC, and Julie Lane and Liz Underwood were elected, all to serve for one year. We recently held our Tower AGM. Fr Michael chaired the meeting, which was held in the Tower after ringing practice. All of the officers remained the same except for Jonathan Sweetman who replaced David Lynch as Steeplekeeper. We welcomed a band of visiting ringers from the area around Newton Abbot who had requested permission to come and ring a Quarter peal of Grandsire Triples on our bells. Their attempt was successful. Another band of visitors have permission to ring in the near future. We are occasionally joined by visitors from other towers at our normal service ringing or practices. They are normally staying in the area on holiday and we are pleased to welcome them. Several of our ringers helped out on the Association Training Day which was held in both the Tewkesbury and Cirencester areas. Our own tower was not used for this purpose this year, but those who went as either helpers or learners found it a valuable experience and made new friends. Those of you who recently wondered why the clock chimes were not sounding healthy will be interested to know that when the clock hammers were inspected in the tower, the hammer on the third bell was found to have sheared off from its shaft. This has meant that we have had to stop the clock from chiming the quarters, but the hour is still struck as the mechanism for that is separate. We are in discussion about how to proceed with the repair. Every year in Holy Week the bells are silent and we take the opportunity to spring clean the ringing chamber, we are always amazed at how many cobwebs we find! Several weddings that have been booked for 2006 have requested that the bells be rung, so we are approaching the busy season! We have now done two full terms with ‘Open the Book’ at St Mary’s Infant School. Every Wednesday four or five from a team of ten adults read and act out a bible story to the whole school in their assembly. Both the children and adults appear to enjoy the experience and we know that these stories are taken home by some children and related to families - what a wonderful way of spreading God’s Word! At the end of term, we were invited to do our Easter story in St Mary’s Church, together with the children and their teachers and parents. Some parents were delighted to see ‘first hand’ what we were doing as they had heard about it from their children. We are keen to welcome more volunteers and there is no need to have previous experience! Please contact me if you would like to know more. Everything went according to plan and the weather stayed fine for us. Very many thanks to Joan R, Joan A, Jean, Maggie, Rachael, Rosie, Cathryn, Sheila, Eleanor, Mavis, Ann, Linda, Barbara, Gill, Noel, Colin, John P, John M, John B, Bob, Jerry, Phil, Roger, Henry, Cyril, Jonathan, Brian, Stephen M, Stephen A, Michael and Fr Stephen, who found a cobweb high up and removed it!! We enjoyed coffee and large hot sausage rolls in the middle of the morning which went down a treat. Thank you John Fogarty, ‘Bakery Stores’, for the sausage rolls and also for donating the milk. This interval enabled us all to chat with one another, especially with those whom we do not know very well; we see them briefly in Church and that is all. On Saturday the 8th of April, the Prestbury 1st XI faced St Matthew’s, who had at their last clash won 8-2. Things started badly, with St Matt’s taking full advantage of the ‘penalty’ supposedly conceded by Prestbury in the 2nd minute, but it seemed as though Prestbury would be able to hold out. Hopes were high, as the team had been showing a steady improvement throughout the season. Unfortunately, things all started to go wrong. Despite gallant work from our stand-in goalkeeper, Ben, too many goals were leaking through the Prestbury defence for the scoreline to stay the same for long. Andrew Murton, on his Prestbury debut, pulled back two well-deserved goals, but not even the arrival of Michael Wyatt as a last-minute substitute could salvage the match, which again finished Prestbury 2, St Matthew’s 8. On Wednesday 22nd of March, Years 3 and 4 from Prestbury St Mary’s Junior School were doing Easter workshops at Church to do with the Easter story. We tasted bread to represent the Last Supper (it was very nice). Then we tasted some vinegar and lemon water to show us how sour life can be (it was horrible). Then each one of us wrote down our fears on a piece of paper, stuck it onto a small rock and put it by the foot of the cross. This way Jesus can help us not to be afraid. We had very good time doing the workshops and it taught us all that when life starts to get sour we can trust God to help us always. The Prayer Maze at St Mary’s church was for celebrating Easter and we were thinking about all the things that happened at Easter. I learned lots of things about how things were bitter and sweet at that time. For that activity we tried vinegar to resemble bitter times and after we had water to resemble the sweet, only I didn’t want to have water because I liked the vinegar. I also learned that Easter isn’t just about Jesus dying and rising again. It’s about Palm Sunday and Passover too. We watched some of Shrek to think about when Peter asked Jesus for forgiveness. The Prayer Maze was extremely fun and I think that is was a great opportunity for children to think about Easter. I can’t say what my favourite part was because it was so fantastic. Overall it was a brilliant day and I am glad that I did it. On Wednesday March 22nd Y3H went to church to do some Easter activities. We were split into groups and given an activity to start with. There were eight different things you could do altogether. I enjoyed it most when we ate the bread because it was nice and fresh, this was like when Jesus broke the bread at the Last Supper. The activity that I thought helped me understand Easter the most was The Dead End. We moved a red line and a white line to form a T. The white line formed the stem of the T, we moved the white line on after the red line so show that there was life after death: †. Another interesting thing was when you got a stone and a sticky label and on the sticky label you wrote something that scared you or worried you, then you stuck it on the rock and put it on the table with the others. At the end we got given a flag and you had to wave it and shake an instrument while you sang Hosanna. I really enjoyed this prayer maze and I thought it would help me remember on Easter day that Jesus died and rose again. The prayer maze was celebrating Easter. I liked the part where bread represented the Last Supper. I also enjoyed singing the song at the end. I learnt that Easter is a joyful time. I’d really like to repeat the experience. It helped me to understand the meaning better, and what Jesus did for me and the world. A grubby hungry boy pulls at my arm as we walk back from supper. In a doorway a man with one leg holds out a hand and from my other side I am offered beads, bracelets and Buddhas. There are few tourists in Kathmandu this season so every trader wants my attention. We cannot possibly give to everyone so with relief turn into the peaceful courtyard of our colonial guesthouse. It would be easy to be overwhelmed by the narrow dusty streets filled with tooting taxis, jingling rickshaws and weaving scooters, and lit by shop generators since there is no reliable public electricity, but we do not feel unsafe as one might do in poorer parts of London. No doubt the Nepali are poor and the political system keeps it thus. We cannot change that so go with the colourful throng through open markets to the sights of any capital city. 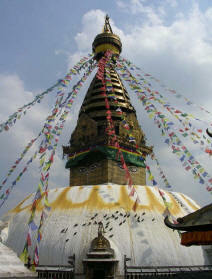 Kathmandu is the union of three kingdoms, so in close proximity are three sixteenth century palaces and courtyards. The carving of the wooden verandas is intricate, the paint faded, but metal shining from the touch of many devoted hands. Patan is smaller, quieter and easier to take in. Outside are Buddhist stupas (right), and Hindu shrines to the gods in their many forms. A man latches himself to us and explains again the stories. Here there is also a sixth century public bathing pool still in use. Hindu holy men in yellow and orange mingle with burgundy Buddhist monks, while the common throng is all colours, the women mainly in bright saris but the men rather grubbily trousered. Over everyone armed soldiers and police keep a watch. Around the temples are stalls of awful trinkets and tourist trash, the general population being no more devoted to their duties than Europeans. Nevertheless, during the day, a wedding party chants through with cymbals, horns and incense; a group of women in bright red offer rice, red and yellow dyes, and flowers to a Buddha; a family with children offer incense, pour water and ring bells to a goddess who brings fertility and protects children; fire is put to the mouth of a funeral pyre, and we watch three other public cremations in various stages of combustion. Suddenly everyone rushes to the door to the inner courtyard. A golden sedan chair moves through the crowd and a little girl dressed in red, yellow and golden mask is carried inside. She is the living incarnation of the goddess Teleja and lives a cloistered life until puberty, when another girl is chosen by ritualistic trials. Although she will receive a small pension she will find it hard getting back into everyday life. Any capital city is a poor reflection of its rural life. On a four-day trek in the Annapurna foothills we see stone and wood houses clinging to steep mountainsides with terraced fields. Where it is too steep or high rhododendrons fifty feet high spread pink and red above us. Monkeys leap, parrots chirp, and eagles soar. Goats and oxen wander the woods and people gather fodder or diced wood, which is neatly stacked under the veranda. On busier routes teams of mules carry essentials, but small groups of a family carry baskets slung off their foreheads, and even a small child with two granite slabs. Six thousand irregular steps zigzagging up from a raging turquoise river to the village cluster takes us a draining two hours, but children are skipping up and down in their neat school uniforms. All this is shared with Sarah whom we have met on our arrival. The team is in good heart and has dispersed for family time out. It is fabulous to see her again and watch the team absorb, then resolve problems. The mountain equipment has arrived late so I sit in a room filled with Sarah’s and Ro’s kit which has to be sorted into cycling, base camp and advance base camp, packed and labelled. The climbers are all here, three half asleep but my brother, Nigel, relaxed after a day with us already. We are going out to a Nepalese restaurant tonight with the sherpa team, before the cyclists leave tomorrow and climbers next week. Political demonstrations are forecast in a few days time so we have experienced a beautiful country spoiled by the squabbles of jealousy. We detect no such thing in the EverestMAX team and wish them wise protection on the mountain. Sarah Lyle and the cycling team, continuing their journey from the lowest to the highest point on Earth, reached Nepal on 14 March. They visited the remaining two of the three charities they are supporting: a PRACTICAL ACTION project making bicycle ambulances and an SOS CHILDREN’S VILLAGE. 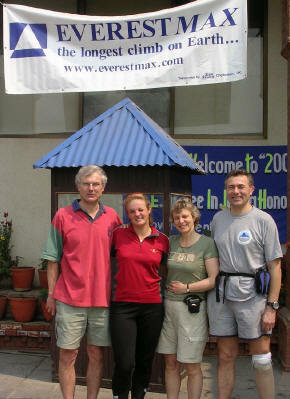 On 21 March, three months to the day after setting off from the Dead Sea in Jordan, they arrived in Kathmandu, where they met up with the climbers (including Sarah’s uncle, Nigel Lyle) who are joining the team for the ascent of Everest, and with family and friends who had flown out to visit. (Sarah’s parents have written an account of their visit.) While in Kathmandu the team member wrote their own personal reflections on the three months’ cycling - Sarah’s message is posted on 28 March. On 1 April the cyclists left Kathmandu, spent the next day white water rafting, and then met the climbers at the border and crossed into China/Tibet on 4 April. After a few days together, the climbers went on ahead by vehicle. The cyclists followed and reached Everest Base Camp on 12 April. After 112 days on the road and 8000km through eight countries this is end of the cycling phase of the expedition. For the full diary see www.everestmax.com. A way to communicate with God. Trying to speak to God. How we pray thankfully for our family and health. A quiet time to think. to celebrate your love for us. as we go our different ways. in those we meet day by day. We finish off Surprise - leading to action, and then turn to the Big Picture, which involves such things as Heaven and Christian Aid. Do come and join us at 9.30 on Sunday mornings in St Mary’s church. Coffee and chat afterwards. During Lent this year the members of Celebrate! Plus decided to attend one of the several Lent groups that are held in the parish. The Lent groups are small informal groups held weekly through Lent and hosted at home by members of the parish. We were included in a group hosted by a member of All Saints’ Church, which also included other people from All Saints’ as well as St Nicolas’ and St Mary’s. Each session began with listening to a CD where people such as Archbishop Rowan Williams and Patricia Routledge (aka Hyacinth Bouquet!) discuss the topic of the week such as ‘Where is God... when we make decisions?’, ‘Where is God... when we face suffering?’ and ‘Where is God... when we try to make sense of life?’ and then we discussed the topic as a group. It was very interesting and enlightening to hear what leading Christians had to say about these important questions and it was a good opportunity to get to know members of the parish by exploring and reflecting on these questions with them. On Wednesday 22 March Celebrate! held their first ‘Ladies night’. With a huge thanks to Sharon who kindly hosted the event, the evening was a great success. It was very well supported and everyone was warmly welcomed and well looked after with good wine and plenty of nibbles. Whilst it was a very sociable evening, it was also very relaxed and a great opportunity to meet new friends and to get to know others a little more. The evening was open to everyone and you were able to bring a friend. Liz Bennett kindly brought along some Phoenix Cards and Ruth Moore displayed some Beaded Jewellery which was great to browse over and their efforts were very much appreciated, particularly with all the setting up and packing away involved. By the end of the evening, many ideas were proposed for future social events so as we have now started, may it continue! At the time of the Norman Conquest Prestbury already had a manor house, near the race course boundary off Spring Lane. At that time the Lord of the Manor was the Bishop of Hereford. His tenure was on the same basis as that of any lay landowner, and did not mean that Prestbury was ever a part of Hereford diocese. Day-to-day running of outlying estates like this one was in the care of a senior official, and the bishop himself would visit once or twice a year to attend to any matters of importance and to enjoy the particular amenities of the place. At Prestbury the prime attraction was a deer park; when Bishop Swinfield kept Christmas here in 1289 his hounds were sent in advance and 50 horses were stabled at the manor over the time of the feast. On at least one occasion ordinations were held in the chapel, and as late as 1480 episcopal documents were signed at Prestbury. The deer park occupied a large area and was a dominant feature in the landscape. The low hill clothed with forest trees stood out among the cultivated fields of Bishop’s Cleeve, Prestbury and Swindon. On the 19th century Tithe Map its outline is plain, showing up like a fossil in the general pattern of fields. From the eastern boundary close to the site of the manor house it extends west in a large egg shape, covering the whole of the race course (why did you think it was called Prestbury Park? ), and continuing the other side of Evesham Road past Hunting Butts farm, until the land falls away towards Swindon. South from the manor, the edge of the park runs close against the bottom of the gardens along the Burgage, and then follows the modern race course fence west; beyond Evesham Road the southern edge coincides more or less with the line of the horizon north of Swindon Lane. Today hardly a trace remains, but the park has had a lasting effect on the development of the parish. For ordinary people the whole area was completely out of bounds. It put a stop to any idea of extending the village further west, and the arable lands of the great West Field along Swindon Lane were almost cut off; they were joined to the rest of the parish by two rows of fields either side of New Barn Lane, and an even narrower strip of land along the northern edge between park and boundary brook. In the 12th century, the bishop of the time gifted a proportion of his manor to the monks of Llanthony Abbey. At first their headquarters here were in Noverton Lane, where excavations in the 1950s revealed a second moated site, now built over; it seems that in the 14th century they moved down into the village, building what we now know as the Priory. The inhabitants of these buildings were not monks; agricultural work and administration would have been carried out almost entirely by lay people, with occasional visitors from the Abbey at Gloucester. But Llanthony did provide priests for the parish church, and was responsible too for later stages of building at St Mary’s; the carved coat of arms high on the south side of the tower bears the initials I W, for John Wyche, prior of Llanthony around 1420. At the Reformation Llanthony Abbey was disbanded; its lands in Prestbury were acquired by the Baghott family, the estate forming a second, independent manor. By 1540 the Baghotts were living in a newly built ‘fair house’ in Noverton, known then as Hall Place (later Noverton Farm). In the next century they too moved down into the village, taking over the old Priory House. Society was changing now. The bishops of Hereford no longer needed Prestbury as a hunting lodge and were leasing their land out to a tenant. Then under Queen Elizabeth it was exchanged for another manor, and the bishops finally pass out of the Prestbury story. The manor’s new tenant was a retired ambassador, Sir Thomas Chamberlayne, who made major improvements to the old house, with decorated plaster ceilings and an ornate stone fireplace. When he died in 1580 he bequeathed it to his eldest son; it is clear that he intended his expensively improved mansion to be the permanent family seat - a real stately home in Prestbury. This is the second of three articles about Prestbury Parish. May is the most important month in the Christian Aid Year, as all Christians are asked to take part in the collection for people in underdeveloped countries. We can help by praying, giving and, if possible, collecting and counting the donations. The house-to-house collection is from May 14th - 20th. Do please get in touch with us if you can spare an hour or two to help. Before this, as a ‘warm-up’, there will be a Christian Aid fair on Saturday 6 May from 11am - 2pm in Holy Apostles’ Church Hall, London Road. There will be Fairtrade coffee, stalls for food, toiletries, books and so on plus the chance to buy an excellent Ploughman’s lunch and dessert. We shall be running the grocery stall and would be grateful for contributions to it and to the other stalls. There will be boxes in both churches on the two preceding Sundays. Volunteers to help on the stall would also be very welcome. Thank you. Following on from the success of the last couple of quiz nights, we are holding a Parish Quiz on Saturday 6 May at Prestbury Hall in Bouncers Lane (opposite the schools) in aid of church funds. All ages are welcome with questions to suit everyone. There will be ten short rounds with a fun/oddball round to confuse everyone and a picture round that always creates a debate! The evening starts at 7pm and runs till about 9.30pm with a licensed bar. It’s £2 per person to enter and the winning team gets a cash prize, but it’s the taking part and the fellowship that is important here. So get into teams of 4-6 and come and enjoy a fun filled evening! The next bakestall at St Mary’s is on Sunday 21 May with contributions from those with surnames N-Z. Do contact one of us if you would like to join the rota. Our next meeting will be on Tuesday 23 May at 7.30pm in St Mary’s Church. Our speaker will be Canon Sarah James and her subject will be ‘Images of God’. Please join us if you can. Please make a note of these dates and try to join us for fun and fellowship. Thank you to everyone who sponsored Lilies in memory of loved ones. We urgently need someone to take over as Lettings Secretary for St Nicolas’ Hall. The job is very small and can be done from home. It splits nicely into two halves - Occasional Bookings, which takes at most an hour a week, and Regular Bookings, which takes about half a day twice a term. If you feel you could take on one or both halves, please contact Nigel Woodcock, Alan Jackson or Tricia Wilson.